Comm Eye Health Vol. 17 No. 50 2004 pp 27 - 29. Published online 01 June 2004. Measuring vision in children is a special skill requiring time, patience and understanding. Methods should be adapted to the child’s age, abilities, knowledge and experience. Young children are not able to describe their vision or explain their visual symptoms. Through observation, and with information from the mother or guardian, functional vision can be evaluated. While testing and observing children, an experienced assessor notices their responses to visual stimuli. These must be compared with the expected functional vision for children of the same age and abilities, so it is important to know the normal visual development. In normal visual development, children start by observing their mother’s face. Experiences of space, distances, and hand-eye coordination are important steps in stimulating the development of all visual functions during the critical period from birth to five years. Deprivation disturbs this development and may lead to ‘nystagmus’ (pendular, mainly horizontal, involuntary eye movements). Amblyopia or ‘lazy eye’ is another condition that can result from visual deprivation in early childhood. The most important visual function is visual acuity. If a child has eye problems, visual acuity should be measured as soon as possible. This will indicate if vision is developing normally. It is not always possible to obtain a quantitative measurement of a child’s visual acuity. However, a qualitative assessment by an experienced observer can be very useful. 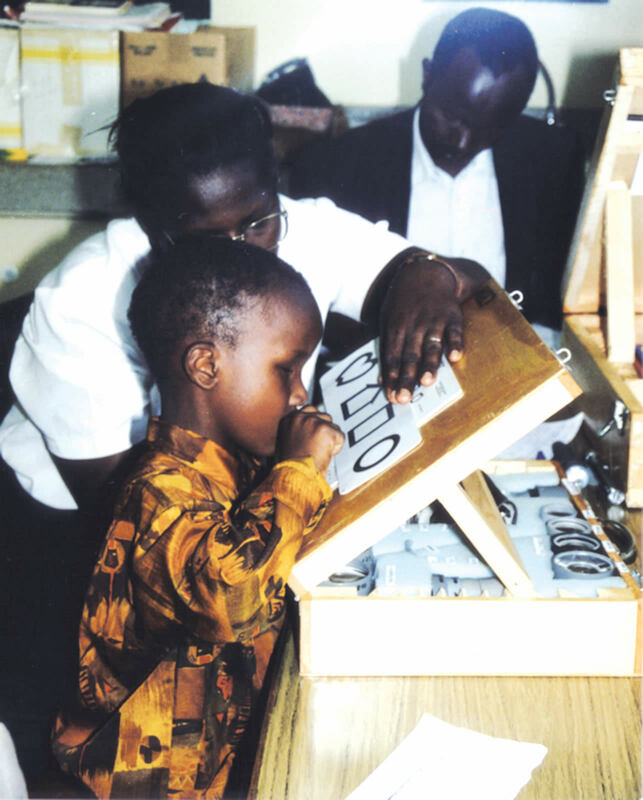 Although a qualitative assessment will show if a child is blind or not, it will not detect unilateral poor vision. Prepare for the assessment and assemble all the testing materials in advance so that the assessment can proceed without interruption. Speak in a language he or she will understand. If you only talk to the mother, the child will lose interest. 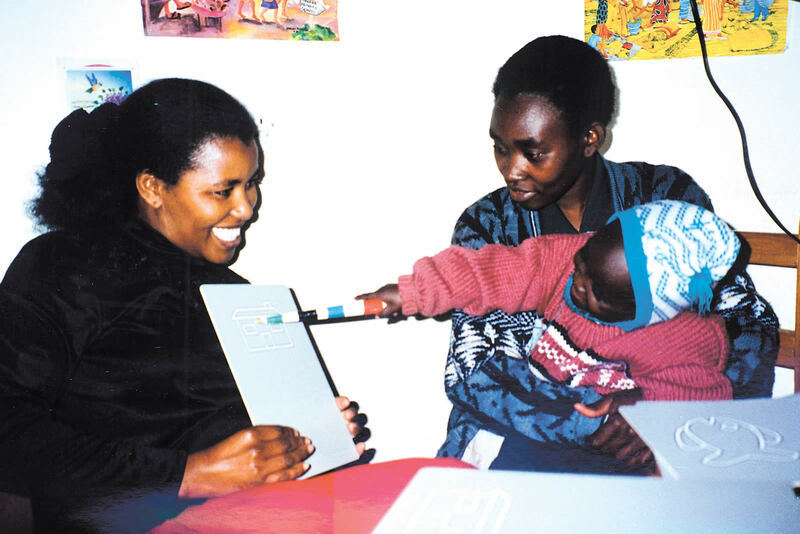 To get accurate results, the child needs to feel comfortable so that you have his or her full co-operation. If the child is sick, crying or hungry it may be better to postpone the assessment, even for half an hour. Small children may do better if they sit on their mother’s lap. Explain the testing procedures to the mother and let her conduct the test while you observe the child. To get the child’s attention, try using an interesting object. This could be a torch or a coloured light, achieved by shining a torch through coloured plastic or cloth. Large objects with high-contrast forms activate visual pathways more effectively than light without forms. Sounds can also be used such as a small tin with rice inside. In this case, auditory attention is used first to reinforce the visual attention, but this is obviously not appropriate if testing a deaf child. When attention is achieved (which is sometimes only for very short periods) observe the child’s behaviour. Does he look towards the object, is there nystagmus, does she reach for the object? Observe the corneal reflexes with a torch. While testing fixation under monocular conditions the corneal reflex should be central; if not, eccentric fixation is present. It is important to note that fixation to bright light can be different from fixation at an ‘accommodation requiring’ fixation target. If you notice nystagmus, describe the type, form and amplitude so that you will be able to compare changes (improvements) during follow-up visits. In cases of squint it is easy to detect the preferred eye, as it is mostly in a straight position. If there is no squint you can use the vertical prism test to induce a vertical deviation. To be sure of the result you should repeat it four times, prism base up and down on each eye. If there is no obvious dominance the preferred fixating eye is always the one behind the prism. A simpler test is to close one eye at a time and compare the reaction of the child. The child will be less co-operative while covering the dominant eye. Move an object of interest in different directions and observe the movements of the eyes. If you show objects suddenly (like in a game of hide and seek) you can observe fast saccades, spontaneous fixation, and also estimate the visual field. If these objects are not noticed, use brighter or bigger ones. Move an object gradually towards the eyes to induce inward movements of the eyes. These should be possible up to about 10 – 5 cm in front of the eyes. Children who are not interested in near objects should be checked with plus-lenses which may produce a good response. Refractive error has a greater effect on visual acuity than any other visual function and should be corrected before measuring visual acuity. In older children you can use the pinhole test. Sometimes it is worth testing visual acuity at different distances (3/2/1 metres) to get an indication of refractive error or to find out if the current glasses are satisfactory. The vision must be tested using one eye at a time, and binocularly, with both eyes open. While testing vision binocularly look for abnormal head postures. Pre-verbal children cannot describe what they see, so they are tested using ‘preferential looking’ techniques. Children will automatically look towards shapes and lines rather than a plain grey surface. These tests are used by an experienced observer to estimate the visual acuity value. In the youngest children (0-24 months) we use grating acuity. This can be tested with the Lea (paddles) Gratings. These tools have black and white stripes of different widths. The thinner the stripes recognised, the better the grating acuity. Two paddles are moved from the midline with equal speed in front of the child, one grey and the other with stripes. If the child is able to recognise the stripes she will turn her head towards the movement of the striped paddle. If the visual acuity is very low, vision can be tested using optokinetic nystagmus. A striped object, either a rotating drum or a tape measure, is moved in front of the eyes. When the nystagmus is induced you know the child is able to detect the different stripes. The distance can be increased and you can observe and describe the distance up to which the nystagmus is still present. The presence of optokinetic nystagmus may not exclude loss of vision due to brain injury. If children are able to recognise and describe pictures or symbols, specific visual acuity tests can be used. These are designed for near and far distance. As children are near orientated the test should be performed at near, and distance visual acuity measured at no more than three metres. The Lea Symbols Test is useful because the symbols are easy to name and recognise. If the child does not speak you can use the key card. An advantage of the test is that the child never ‘fails’, as the symbols are designed to resemble each other, and the child will always have an answer. Children can be trained to function in the test situation at the age of 18-24 months by using the Lea Puzzle. It is better to use a line-test, with several symbols in each line, as single symbols are less useful for detecting amblyopia. In order to refer test results to defined values, specially designed tests should be used according to their instructions. Assessment is not possible at a very young age but full colour vision develops very early. The easiest colour test for children is the matching of coloured objects. Measuring vision in children is a comprehensive task. For diagnostic purposes, follow-up and evaluation of visual impairments, all elements should be considered and compared with the visual function of daily life. Results need to be explained and discussed with the parents or guardian to help them understand the situation and strengthen interaction with their children. This will reduce the visual disability, especially if the vision cannot be improved through medical treatment. I would like to thank Dr Lea Hyvärinen and Professor Siegfried Priglinger who assisted in editing this article and contributed to my professional knowledge, enabling me to perform measurements of vision in children more accurately. I am grateful to Dr David Yorston who supported my work with children in Kenya and also provided valuable comments in the preparation of this article. Hyvärinen L, Lindstedt E, editors. Early visual development – normal and abnormal Acta Opthalmol (Copenh) 1983. Suppl 157: 1-122. Hyvärinen L. Vision in Children – normal and abnormal. Canadian Deaf-Blind and Rubella Association, Toronto, 1988. Hyvärinen L. Assessment of visually impaired infants. Opthal Clinics North Amer 1994 7:219-226. Hyvarinen L. Understanding paediatric low vision. In: Stuen C et al, eds. 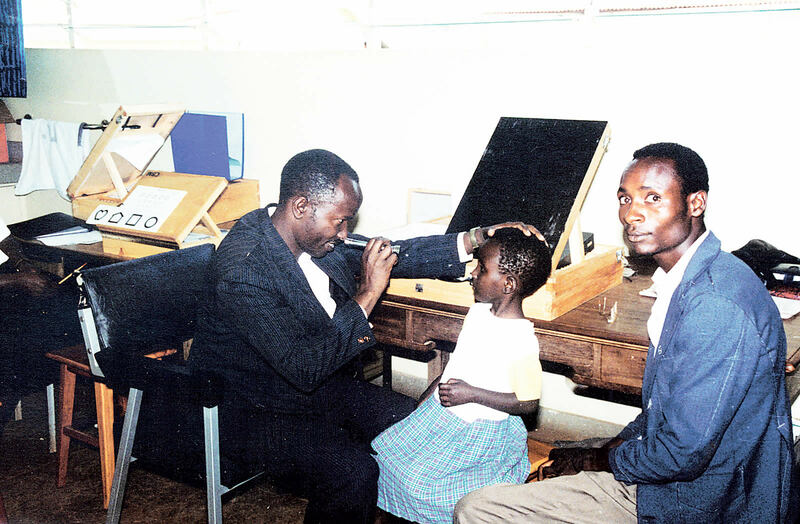 Vision Rehabilitation, 2000. Hyvärinen L. Vision Testing Manual, Precision Vision, Villa Park U.S.A. 1996. Cat. No.2803. Zihl J, Priglinger S. Sehstoerungen bei Kindern, Diagnostik und Frühförderung, 2002 Springer Verlag Wien, ISBN 3-211-83608-X. 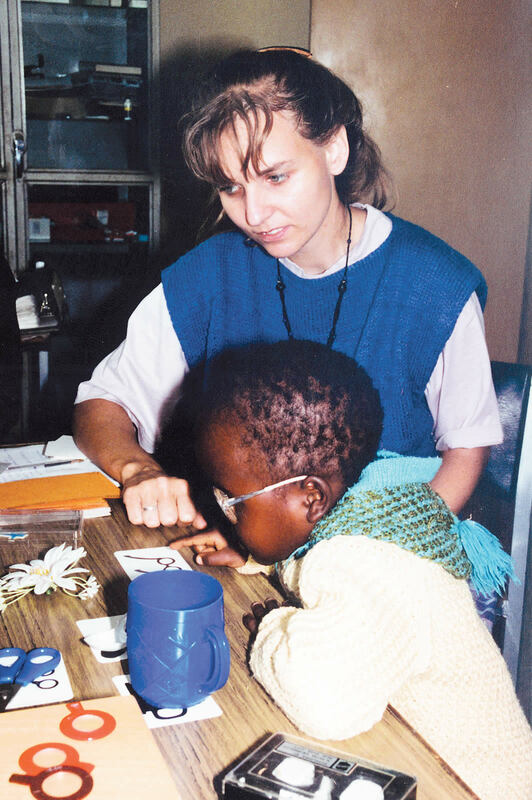 Management of Low Vision in Children. Report of a WHO Consultation, Bangkok, 23-24 July 1992. 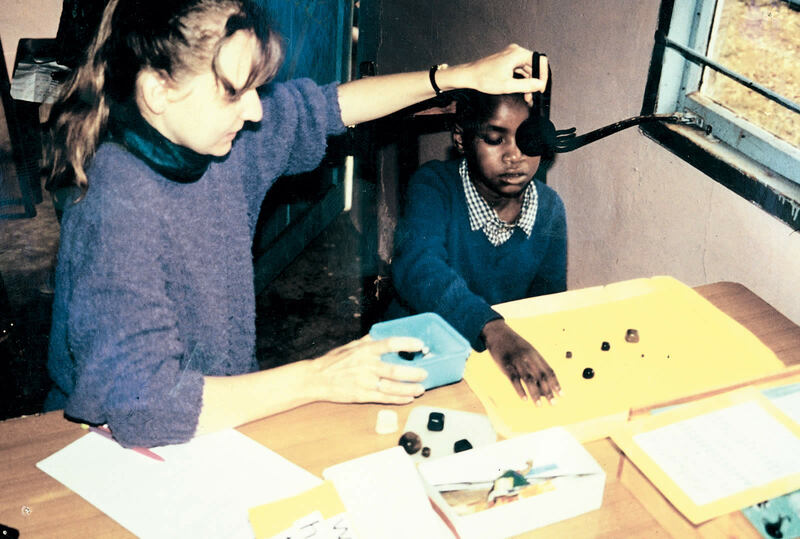 World Health Organization, Programme for the Prevention of Blindness, WHO/PBL/93.27.